The Performing Rights Society debate around online music revenues is continuing (the PRS secure artist royalties for performers.) Today it was announced that Spotify have agreed terms with the PRS, but the YouTube PRS stand-off continues. I have seen this debate rumbling on, but it has been brought to life for me today by some things I have seen. On www.fairplayforcreators.com Pete Waterman, co-writer of Rick Astley's hit 'Never Gonna Give You Up' has written about his YouTube royalties from the Rick Rolling craze. 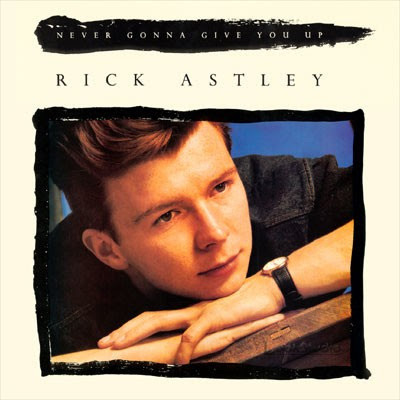 Waterman writes: "I co-wrote 'Never Gonna Give You Up', which Rick Astley performed in the eighties, and which must have been played more than 100 million times on YouTube - owner Google. My PRS for Music income in the year ended September 2008 was £11." (via Digital Examples). 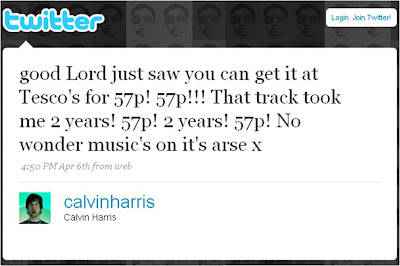 "Right now you can get the track for only 57p.... click here to bag the bargain"
However, Calvin Harris reveals his personal thoughts around this through his Twitter account - not quite so impressed with the 57p price tag! So the argument continues, but I think seeing 100m YouTube views equating to £11 or 2 years of work being sold at 57p per download puts this whole PRS debate into perspective. It's not just about Google / YouTube vs the record industry, it's musician livelihoods too.